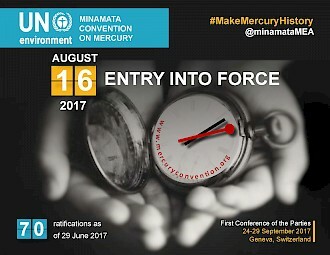 The Minamata Convention on mercury is a global treaty to protect human health and the environment from the adverse effects of mercury. It was agreed at the fifth session of the Intergovernmental Negotiating Committee on Mercury in Geneva, Switzerland on 19 January 2013 and adopted later that year o n 10 October at a Diplomatic Conference (Conference of Plenipotentiaries), held in Kumamoto, Japan. The Convention entered into force on 16 August 2017 after the fiftieth ratification. The first meeting of the Conference of the Parties (COP 1) which will take place from 24 to 29 September 2017 in Geneva, Switzerland has multiple objectives, including procedural, political and celebratory. The Conference will start on Sunday 24 September by preparatory meetings, including regional and Bureau meetings. It will culminate in a high-level segment on 28 and 29 September 2017 hosted by the president of the Swiss Confederation, entitled "Make Mercury History" to celebrate the commitment of the international community to the Minamata Convention.